Many of us will have some form of dream. It might be to travel the world, tick off all those destinations you placed on your bucket list or simply to have a family and grow old with someone you love. It might have been a business idea you had, or even a career change you wanted to make. Many of us go on to live the reality of our dreams, but when it comes to starting a business, some of us are to fearful of the unknown. I wanted to share with you how you can potentially turn a business dream into a reality. It is so important to sit down and work on your business plan if you are serious about making this dream possible. It may seem like a pointless task at this stage, but this is your secret weapon when it comes to the later stages of your business launch and the future. You will be able to outline where money will be spent, projections for future sales, and how you plan to launch your business. It can help iron out some of the more difficult hurdles you could face in the future. 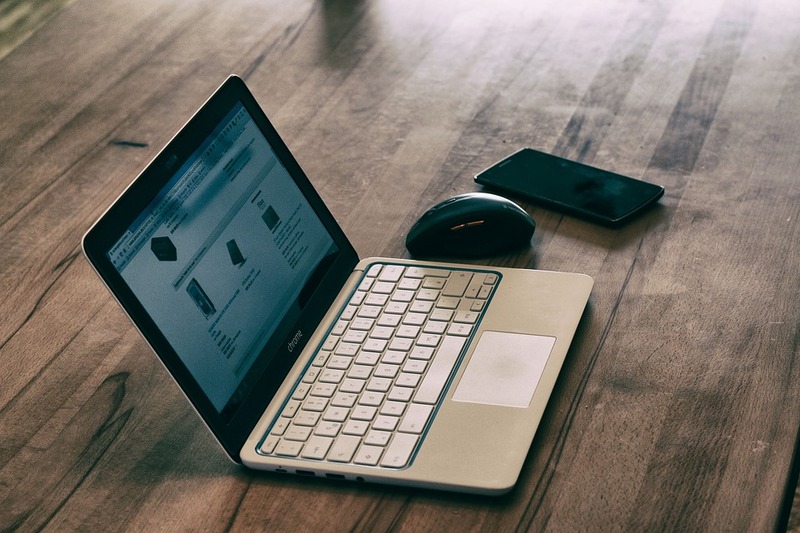 There are plenty of tutorials online to help you create your business plan from websites like entrepreneur.com however, if you don’t feel comfortable, you can always hire someone to do it for you. Funding is a huge part of any business launch, and of course, the upkeep of it moving forward. So it is vital to secure some funding and your business plan can aid you with that. You could choose to find investors who may want a percentage of your business profits. You might also want to look at other options like loans or capital investors like swiftfinancial.com who can advise you on products that might suit your business. If you have the capital, you could invest yourself and use savings or speak with family members. This can often be the point where people seem fearful, but if you have a business plan and are confident, then this shouldn’t be your stumbling block. Once you have your plan and the funding in place it is simply about fine tuning your idea. This is when you can focus on the brand and distinguish a unique selling point. Perhaps enabling you to outshine any competitors you may have in the industry. Focus on what makes your business model or product different from other options out there on the market. Finally, you may find that the only thing stopping you now from turning your business dream into a reality is you. Don’t let a lack of courage bring you down and take that leap of faith. Doing all the necessary groundwork in advance should help give you the confidence that what you have is a solid business idea. So just go for it. I hope that this helps you turn your business dream into a reality. We’re fast approaching the end of 2017; a year that’s seen lots of new developments and plenty of new cars in the auto industry. It’s been a year where many manufacturers have made a clear effort to bring out ‘cleaner’ cars. We’ve seen a whole host of hybrid and electric cars from some of the biggest names in this industry. Today, we separate the best from the rest and look at the top hybrid/electric cars that have been released this year. They’re not in any particular order, but you can bet these are the best ones out there. 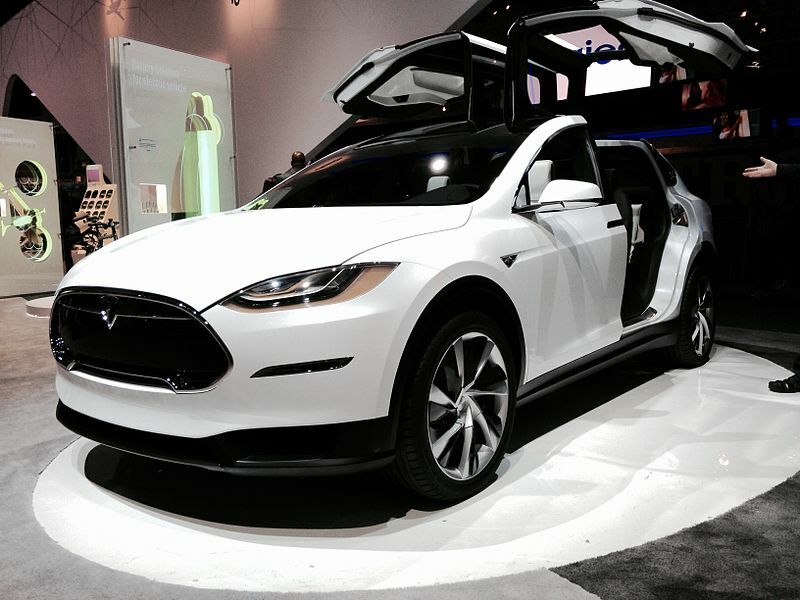 If you’re looking for a fast car with a green engine, then the Tesla Model X is right up your street. We love this car for its ingenuity and commitment to being model and fully electric. There’s no hybrid engine in here, just an absolute brute of a battery-powered one. This thing has over 600bhp and goes from 0-60 in under 3 seconds. Those are staggering stats for an electric car that’s far from supercar territory. The battery is a whopping 100 kWh with a range extending well over 300 miles. As if all this wasn’t enough, it’s a practical car too. This is one of the main reasons it makes it onto this list – it can boast some of the best electric car stats and figures out there, but it still remains a car you can drive everywhere every day. There are seven seats inside (seven!!) which is ridiculous for a car with 0-60 stats like the one mentioned. To make things even better, it looks amazing and is packed full of all the classic Tesla technology. If you’re interested in a full review that looks at all the tech and other features, you can check one out on topgear.com. One final note on this car is that it does have a large price tag. But, for everything you get, it doesn’t actually seem like bad value for money. What we like most about this car is the fact it’s highly practical for the whole family. It’s very much a large family car, and it can accommodate up to seven people, with a decent trunk too. All these features come with a sizeable price tag if you buy it new. 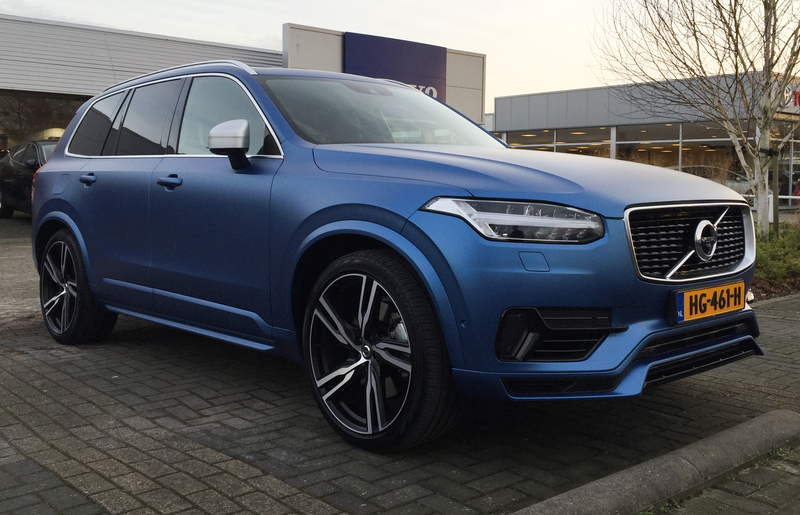 However, you can see WCVolvo.com for more information on used prices, which will greatly reduce how much this costs. Plus, factor in the savings you make thanks to the hybrid engine, and it definitely makes it worth spending more on this version instead of one of the non-hybrid XC90’s. 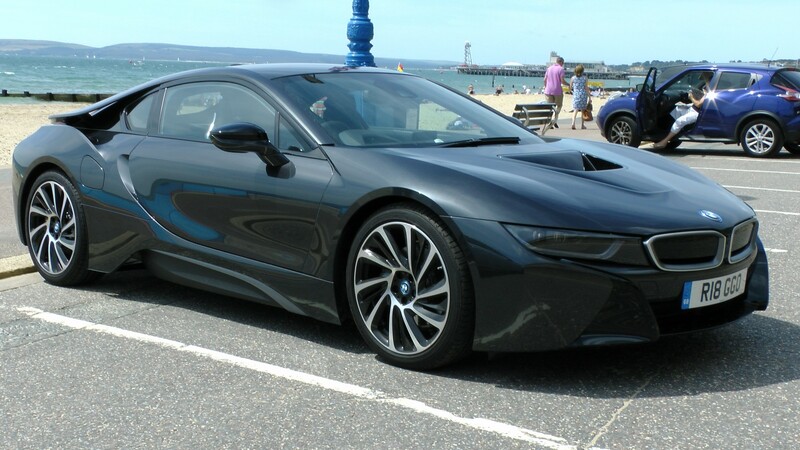 What makes the i8 great is that it completely beats down the myth that hybrid cars are boring. It looks amazing, has some of the coolest doors I’ve ever seen, and drives just as well as any other supercar. BMW claims it has the fuel consumption of a compact car, but in a sports car. There are bags of technology in this car too, it really looks like it came directly out of the film iRobot (you know, that one with Will Smith). Obviously, you’ll have to pay a fair fortune for this, but if you’re looking for a green sports car, this is the best option for you. 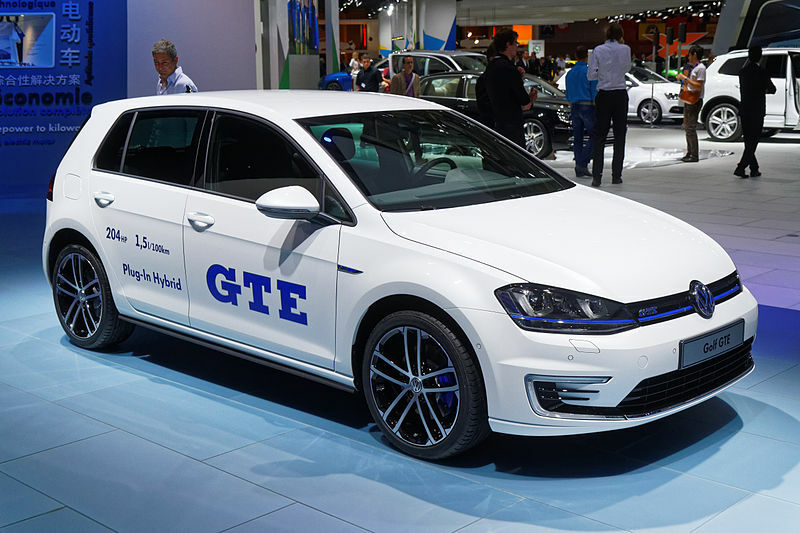 The Volkswagen Golf has long been an iconic compact car. It’s the car of choice for young people all over the world as they pass their driving test and look for something practical, easy to drive, and a little bit sporty. The GTE continues to tick all of these boxes, but it also adds something else to the party; a hybrid engine. Beneath the floor, there’s a lithium battery capable of giving you 31 miles on its own. This battery can charge in just over 3 hours from any power outlet in your home. If you get a proper wall charging unit you can knock an hour off that time. It’s a very handy car that packs a punch too; 0-60 will happen in just over 7 seconds, which is mad for any hybrid compact car that’s not a Tesla. The CO2 emissions are remarkably low too, coming in at around 35g/km – again, pretty mad. What we have here is a car that will do just about everything you want it to do, in classic Golf fashion. The interior is slick, the design is modern, it’s the perfect car for all occasions. Factor in those low emissions and it could well be one of the best city drivers of the year. Here we have the second BMW on our list, and one of the best full-electric cars on the market today. 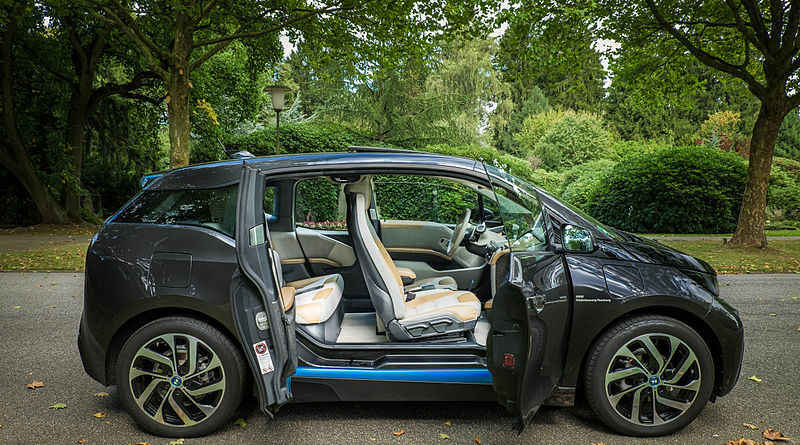 Before we get into things, you have to remind yourself why the i3 was created. It’s specifically made for people that need a small-ish car to drive around a city and not for people that drive across country. With that being said, the full-electric version has a range of up to 124 miles, which will get you to a lot of places when you take short journeys. It’s not a particularly fast car, but that’s not what it’s about. This is a completely green, zero-emission machine, that’s perfect for small families or individuals. If you work in the middle of a busy city that has carbon taxes, this is the perfect mode of transport for you. It’s a smart car that’s cooler than an actual SMART car, and you have all the BMW benefits to go along with the electric motor. It’s got a load of technology on the inside, including some great safety features. Also, if you’re someone that likes this car but is still put off by the range of the electric-only motor, there is a hybrid option that can help for longer journeys. All in all, an affordable electric beast that’s great for city slicks. This makes the fourth car on this list from a German manufacturer as Audi join the hybrid party. They’re a company with a lot of clout, and an eye for executive designs and revolutionary technology. 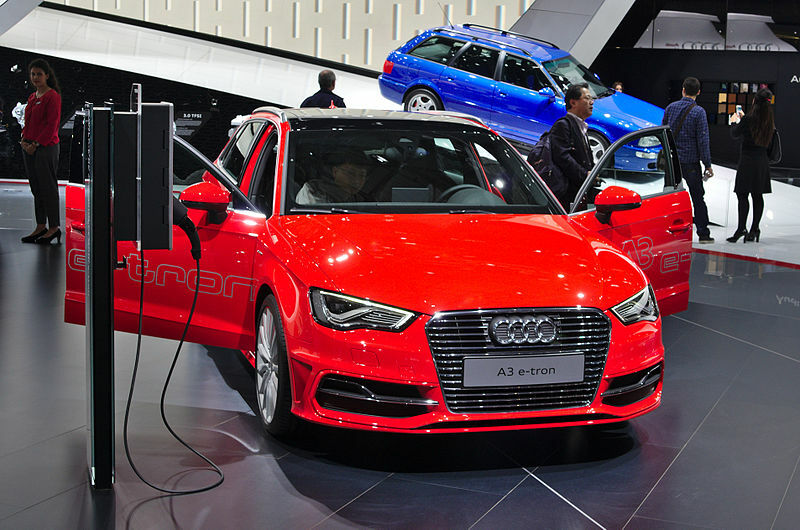 The A3 is a car synonymous with the brand, it offers everything you could want from a mid-sized saloon, and oozes high-quality. What the e-tron does is elevate a great car to new heights. They’ve packed it with a hybrid engine that will provide more than enough range when used in a city. The idea is that you switch to the proper engine whenever you’re making long journeys or need to plug-in your car to charge. In the auto industry, this isn’t a new idea, but it’s new to Audi. As such, you have to give them props for a fantastic first effort. They’ve ticked all the boxes, and this car comes in at a very affordable price. It fits right into the same price range as other executive saloons, but it’s one of the only ones offering this hybrid tech. Speaking of which, the technology inside is built for the future meaning you have a car that will last a long time and prove a good investment. Fancy learning more about this car? Then check out this article on forbes.com for more information about its best features. There you have it; our pick of the best hybrid and electric cars this year. While all these vehicles are fantastic, it’s exciting to think about what the future holds. Are we going to see even more electric/hybrid cars next year? 2018 will surely be the year more manufacturers attempt the full-electric car, which is currently only on offer from a handful of companies. There were recent reports that Porsche is looking to become one of the first major Tesla rivals, so that will be exciting too. My only worry is that there’s a lot of hype surrounding autonomous cars right now, so maybe some manufacturers are thinking of setting aside electric/hybrid ideas? Hopefully not, and we will see some great designs and revolutionary ‘green’ cars next year and beyond. Have you made your bucket list? The process is simple. Basically, it is a list of everything you want to do before you die. Sounds a little morbid, we know, but as we only have one life to live, the bucket list is a great tool to inspire us to live this life to the fullest. 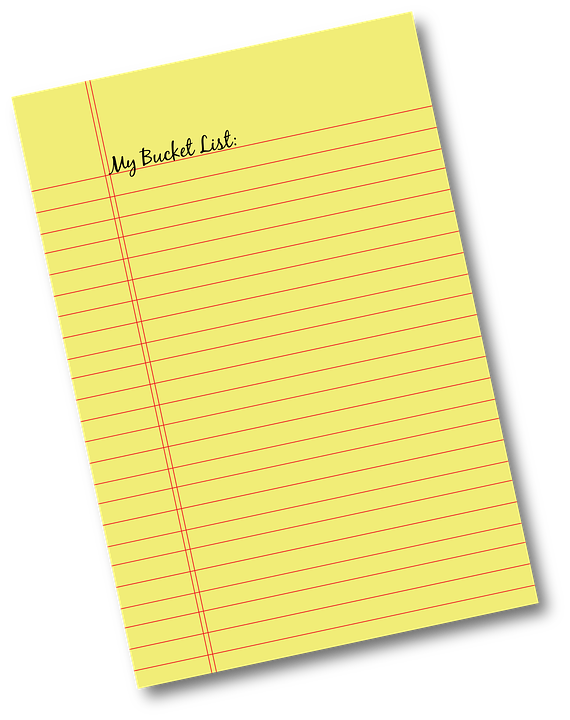 One of the most famous examples is this bucket list created by John Goddard. Sadly, he is no longer with us, but he checked off 109 of his 127 goals. Truly incredible. So what about you? We can’t tell you what to put on your list. It is entirely dependant on your tastes and lifestyle, so you need to take the time and brainstorm, writing down your ideas on a piece of paper or your computer. Admittedly, it’s difficult to know where to start, so consider the following headings. New experiences – is there anything you have never done before, but would really like to? This may be playing a particular instrument, taking part in a daredevil activity, or driving a fancy sports car around a race track. Travel – is there anywhere in the world you would like to visit? From sailing the British Virgin Islands to exploring the Australian outback, think about the places you are desperate to see. Relationships – for many people, getting married often rates highly on a bucket list, as does having a family and making new friends. Career – we spend most of our time at work, but this can still feature highly on your list. You may want to progress up the career ladder, make more money, or even change your job and work somewhere that has more meaning to you. Physical endurance – most of us resolve to spend more time keeping fit at the start of the new year, but your list should be more adventurous. You might want to climb a mountain or take part in a marathon, pushing your endurance to the limits. Be realistic – think big by all means, but choose things you actually intend to do, and not a list of daydreams. Don’t be vague – writing down items such as ‘getting healthier’ is okay, but it is rather vague. Be specific, and include items of relevance, such as exercise ideas or particular foods you want to try. List your passions – don’t write down anything because you think you ‘should,’ such as reading every play by Shakespeare or watching the entire directorial works of Ingmar Bergman. You want to be excited by the things on your list, and not be put off from doing them. Don’t worry if your list changes over time. You can add or take away from it as appropriate. Your life will change, which may mean you won’t be able to do certain things, or you may replace items according to your lifestyle as you get older. It doesn’t matter. The key is ensuring you get to achieve as much as you can over your lifetime, living a life where you can be proud to say “I did that” and be glad about it. The rest of your life begins here. What do you want to do? We wish you every success and happiness.